Categories: Barens, Printmaking, Relief Printing. Tags: Baren, Block Printing, Relief Printing. These rollers feature a cast bronze frame that sits on the benchtop with the roller held off the surface for easy cleaning, etc. When rolling up, simply turn over to opposite side. 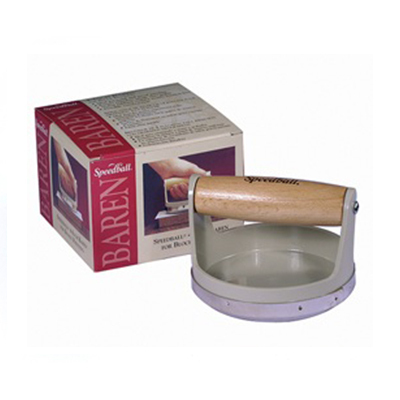 The 80mm diameter hand brayers are made for professional editioning and art colleges, and are among the largest diameter hand brayers made. The roller runs on a friction-free nylon bearing on a polished steel axle, requiring no maintenance or oiling for life. The rollers are clothed in a most sensitive gravure synthetic rubber and in a hardness of 35 Duo. Speedball speed clean is a highly effective cleaner for removal of Speedball Screen Filler from the screen.